I’m gathering as much information as I can. In fact the research is wearing me out. I know this is an effort to feel like I have some control at a time when I feel out of control. Maybe, God is teaching me to turn over the controls. 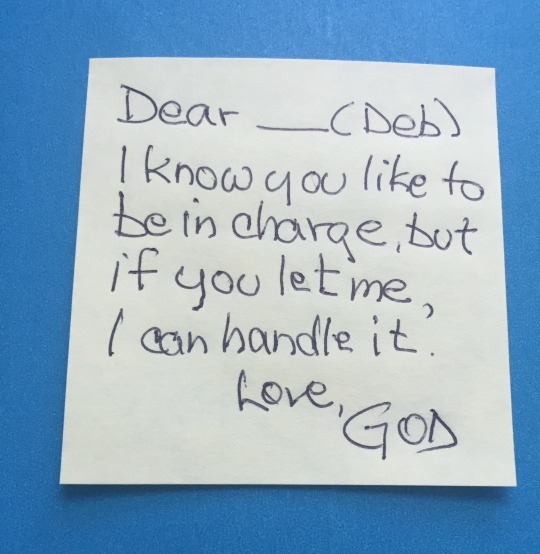 One time, during a sermon the pastor suggested putting the following note somewhere we will see it often. It’s true. I like things to go as I plan them. Am I flexible? Not so much. I’m thinking of the car the high school used for driver’s education. It had a second set of brakes and gas pedals and a steering wheel on the passenger side. The teacher could take control anytime he felt it necessary. I suppose there must have been a button to switch control from one side of the car to the other. Isn’t that a bit like driving through life? Trouble is, we put God on the passenger side for emergencies. Wrong. We really need to ask God to sit in the driver’s seat and show us which way to go. The road of life will have bumps and turns and potholes as we face difficult situations. God doesn’t have a route we would have planned for ourselves—like this brain tumor. He has a plan. He controls it for his purposes. We can take a deep breath and trust that the One who created the universe, can manage anything in our path. If we had the keys to control everything, we would most likely make a mess of things. Who sits in the driver’s seat of your life? I like to be in charge, yet I know you can handle it—if I let you. Please help me to know what I can control and what I can’t control. Please help me to know I can’t do it all the way I want to. Amen.